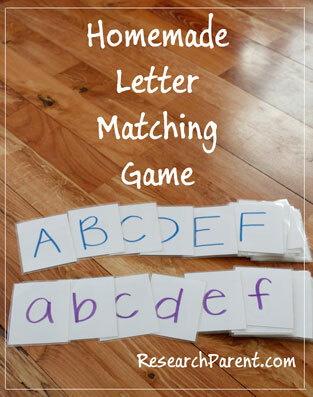 This letter matching game is very simple, and it doesn’t seem like it would be much fun, but even kids that in general don’t seem to be interested in learning letters seem to like matching these cards. 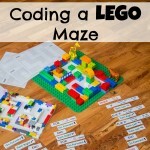 I think this “game” is best used when the child is fairly confident with the uppercase letters and still learning the lowercase. The way I normally use these cards is by taping up the uppercase letters in a line on a wall (neatly and in order) and then taping the lowercase letters nearby in a random jumble. 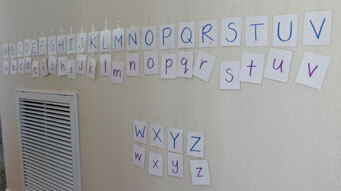 The child then has to move all the lowercase cards to the spot underneath the corresponding uppercase letter. 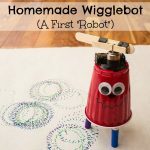 I’ve found that if you sit by and watch instead of helping, the child is often able to correct their own mistakes as they go. You can also play with the cards using standard “Memory” matching format. 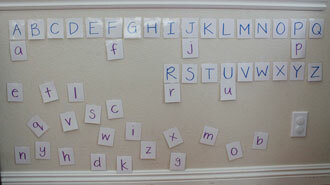 Write each of the 26 uppercase letters on 26 cards in one color. 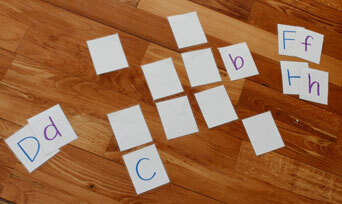 Write each of the 26 lowercase letters on 26 cards in a different color. Trim the cards leaving a small laminated border around each one. Now you’re ready. Tape the cards on the wall as described above and shown below, or play a “Memory” game with the cards by laying all the cards upside down in a grid and take turns flipping over 2 cards and trying to make pairs. 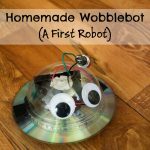 I haven’t tried it, but you could also use the cards to play your own homemade version of letter go-fish.